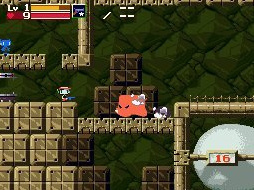 It's Cave Story on the go! For all of you European Cave Story fans, Nicalis has just informed us that the DSiWare version will be submitted to Nintendo's lotcheck within the next two weeks and hopefully will see a release in European territories soon after. It's been a bit of a long wait for European gamers, but hopefully that wait will soon be over. You can find out what we thought of the game by checking out our review of the game, and we'll keep you posted on any new information and an exact release date as soon as they become available. I wonder how many people will buy this with the 3DS version on the horizon? That is, if Cave Story 3D ever comes out in Europe. ^I won't. I already have the WiiWare version, and if I want a portable one, I'd rather wait for the 3DS one. This is annoying, as I've just spent my free 1000 points on games I ended up not liking. Still, I don't expect the 3DS version to come here for a very long time and region locking makes importing impossible. @Highwinter: Free 1000 points? Are they still doing that? @Odnetnin: I was thinking the same. IMO, its likely the original Cave Story for DSi won't be transferable to 3DS for that reason. It may disrupt sales of the new 3DS version. It's awesome game peeps. You should get it, if you don't have it already, or not. @lz20XX: I could've swore they mentioned somewhere that they aren't going to ALL be transferable and if that's the case, Cave Story, in the business sense, shouldn't be since it'd affect sales of the 3DS version. Of course, I'd like nothing better than to be proven wrong. Delay could hurt this with the definite portable version being made. They still have the free 1000 dsi points? @HeroOfTime007 nope, that was just for DSi during it's launch. Its 2012 in less than 3 weeks and still no cave story. less game I need to carry with me.